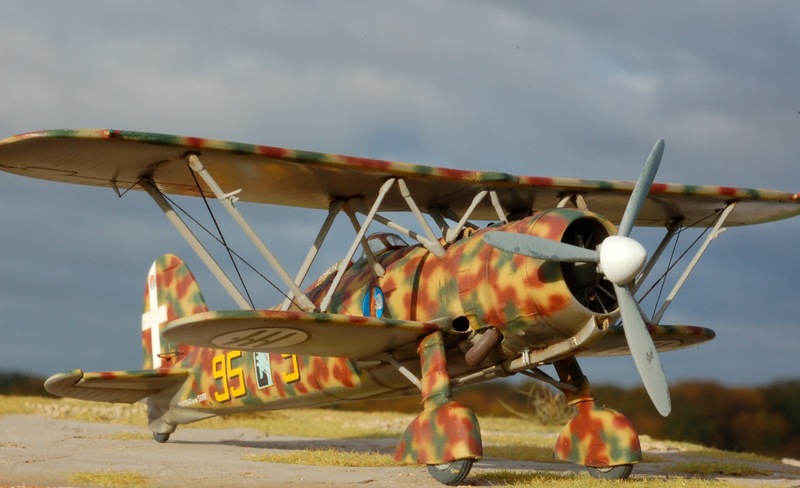 This was Italy's last combat biplane and the best of its kind. 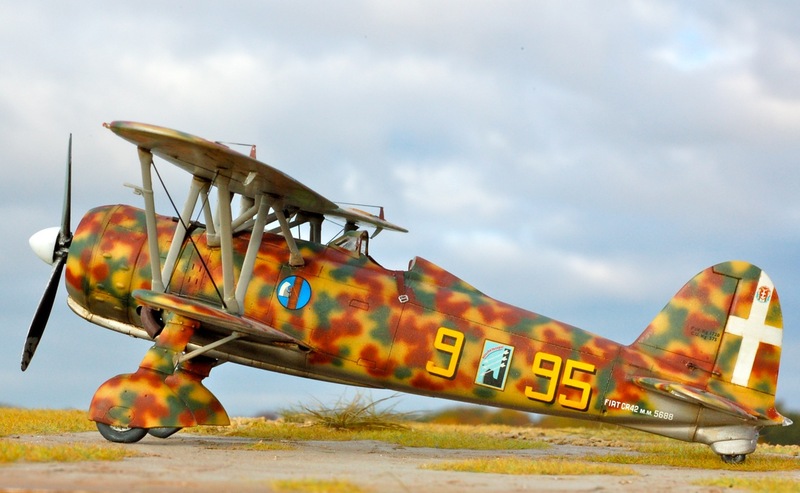 Among the various aircraft that Italy had tested in the Spanish Civil War, was another biplane fighter, the Fiat CR.32, a highly maneuverable airplane that was fairly fast and well armed, which had been designed in the early 1930s. Because of the operational, technical, and military success of this airplane, Italian authorities developed a successor to this plane as the Italian monoplanes were readied. 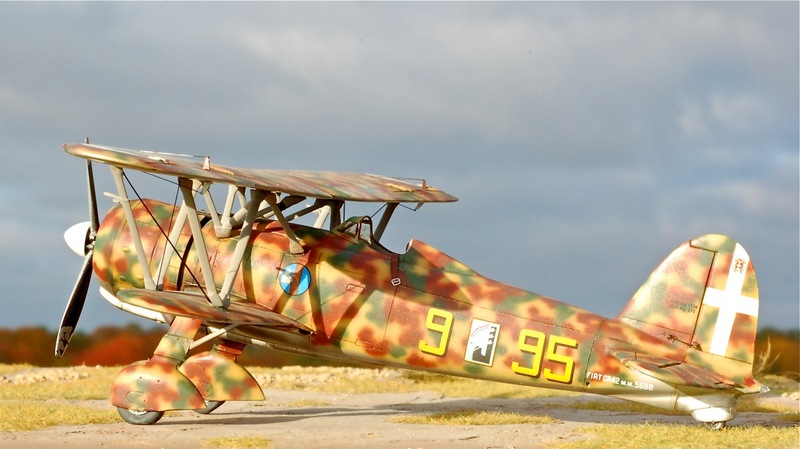 Celestino Rosatelli, who was responsible for the CR.32, outdid himself in producing the CR.42. The prototype of the 'Falco' (Falcon) first took to the air on May 23, 1938. It had the same general form as its predecessor. 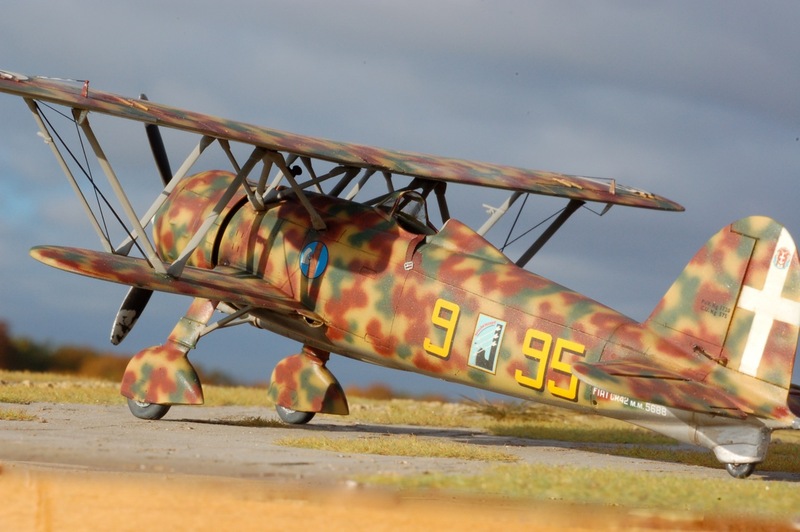 It was a single-seat biplane with an all-metal skeleton and a composite skin of duralumin and fabric. A sesquiplane structure with W-shape struts and steel cables, it was sturdy and aerodynamically clean. The fixed under-carriage was faired, and the cockpit was open. The armament consisted of a pair of 12.7 mm Safat machine guns mounted on the hood of the engine and synchronized to fire through the propeller disc. Each gun had 400 rounds. The CR.42 had a different engine from its predecessor. Instead of the 600 hp Fiat A.30 RA in-line engine of the CR.32, the new airplane was powered by an 840 hp Fiat A.74 RC 38 14-cylinder radial, which drove a three-blade metal propeller with variable pitch. A radial engine was chosen for reasons of safety in combat. It was simpler, and because it was free of radiators, tubes, and cooling tanks, it was less vulnerable than a liquid-cooled engine. The prototype's test flights were successful, and it attracted attention in Italy and abroad. The Italian Air Force placed a first order for 200 aircraft, Hungary ordered 50 airplanes, Belgium ordered 34, and Sweden ordered 72. The first Italian unit to receive the CR.42s was the 53rd 'Stormo', which was equipped with the airplane in May 1939. 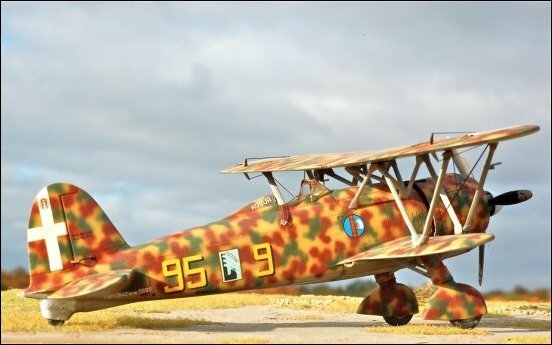 When Italy entered the war, 300 airplanes had already been built, but the first CR.42s to see military service were those which had been sold to Belgium. The Belgian airplanes went into combat on May 10, 1940, when the Germans attacked. The Belgians shot down three enemy airplanes. 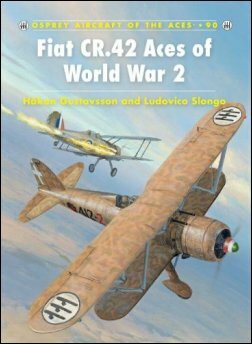 One month later the Italian CR.42s went into combat. They took part in the French campaign and then in the campaign over the English Channel. They also saw service in Greece, the Mediterranean, and in Africa. The airplane was used most intensively in Africa. The last air duels between biplanes took place there before the arrival of the Macchis and Fiat G.50s and the English Hurricanes and Spitfires. 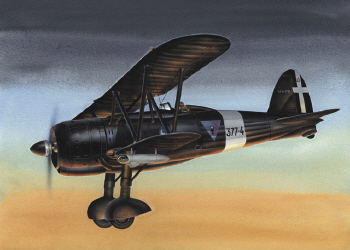 The CR.42s faced Gloster Gladiators, which were also the last of a generation. 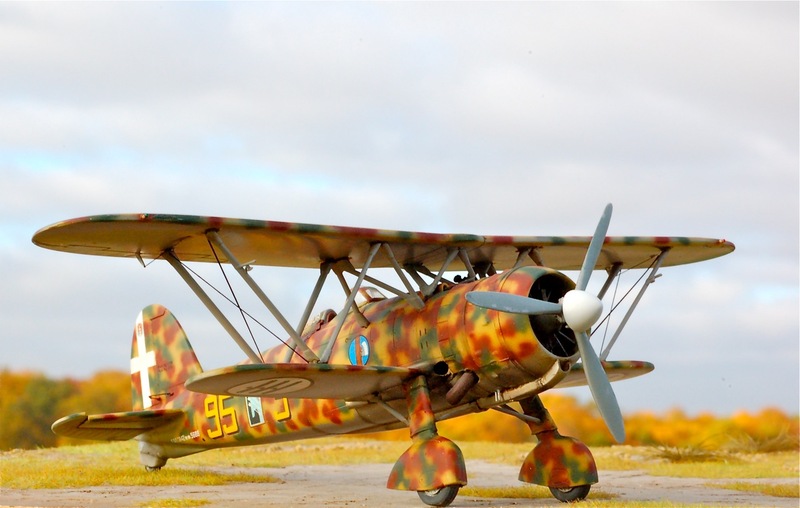 As the Italian monoplane fighters appeared, the CR.42 was gradually reassigned to other roles, including reconnaissance and observation, ground attack, and night fighting. The ground attack version was slightly modified by the addition of two wing racks for a pair of 220 pound (99 kg) bombs. More extensive alterations were made for night fighting: a radio was installed, along with two photoelectric cells under the wings, and exhausts with fireproof shrouds to hide their glow at night. 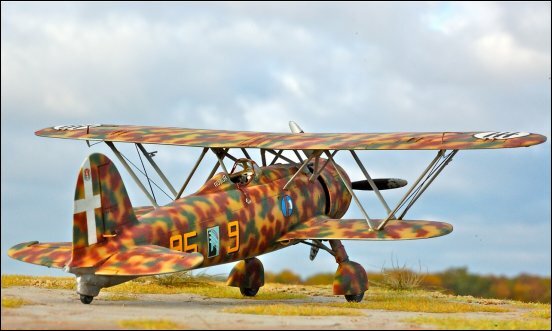 It did not have an extensive career in this role, although night-fighter CR.42 units were based in several Italian cities. Of the 113 airplanes that were in service in September 1943, some were turned into two-seat trainers and continued in service until the 1950s. Other alterations were considered during production: A seaplane version was considered, along with a model with retractable under-carriage and one with a 1,000 hp Daimler Benz in-line engine, but none of these were built. This is basically the Italeri kit with a Vector engine and a spare propeller (Italian Classics?) 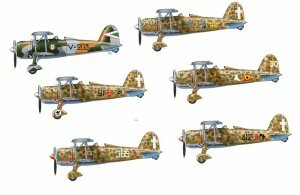 Stormo Decals Italian Aces Part II were used. Concerning paints: GM 3 is from Mr Kit, H302 gunze for the green and H17 gunze for the Brown. 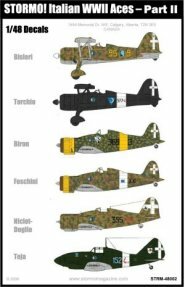 This is the aircraft of Italian Ace Sottotenente Franco Bordoni Bisleri, 95a Sq., 18o Gruppo, 3o Stormo, Mirafiori, Summer 1940. The white spinner of Bisleri's fighter signified that it belonged to 95a Squadriglia - 83a and 85a Squadrigiia used red and green spinners respectively. 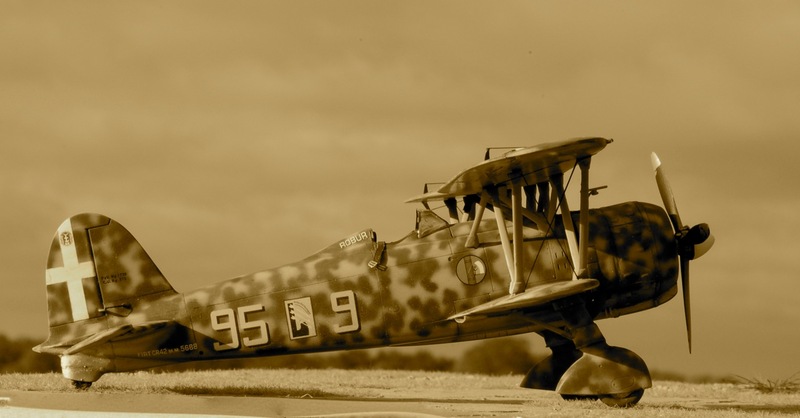 In a rare early-war example of aircraft individualism (Italian aicraft crews preferred to work in groups) within the Regia Aeronautica, the ace had the word ROBUR painted on his fighter's headrest fairing in white. This was Bisleri's nickname, and it was derived from the advertising slogan of a famous liqueur produced by his family firm. 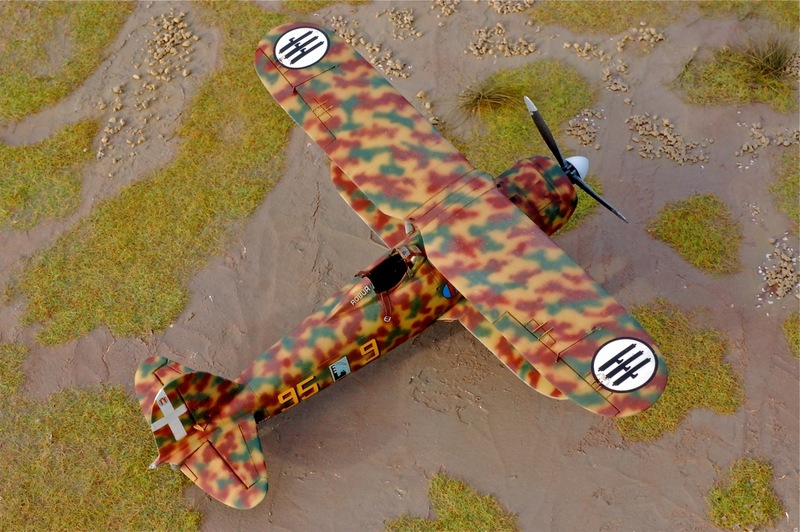 Bisleri claimed five kills with the CR.42 in North Africa.